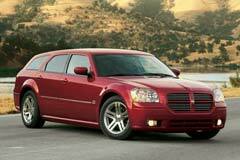 The Dodge Magnum is a full-size American Station wagon with spacious cargo capacity. The name Dodge Magnum was first used for large coupes, introduced by Dodge in 1978 and 1979. The 1978 Dodge Magnum was a muscle car featuring rectangular headlights behind clear covers. The standard features of the coupe included opera windows, power steering, low profile vinyl covered seats and standard adjustable suspension. The Magnum’s brief life ended in 1979, when it was replaced by the Miranda. The Magnum name was revived in 2004, when the station wagon version of the Chrysler 300 sedan was introduced. Originally, there were three trim levels of Magnum: SE, SXT and RT. The engines were available in a range of 2.7 liter V6 to the 6.1 liter Hemi V8. The used Dodge Magnum started off as a rear-drive vehicle, but all-wheel drive quickly became an option in 2005 on SXT and RT models. The all-wheel drive models are specifically designed to offer excellent cornering. 2006 Dodge Magnum SE Dodge Magnum (Runs Rough) Low Compression! 2005 Dodge Magnum 2005 Dodge Magnum RT Full RESTO Mod Pro Touring New Motor, New Everything!